If you have access to ARTE, the Franco-German cultural TV channel, don’t miss “Niki de Saint Phalle and Jean Tinguely: the Bonnie and Clyde of Art,” a 55-minute film by Anne Julien and Louise Faure. 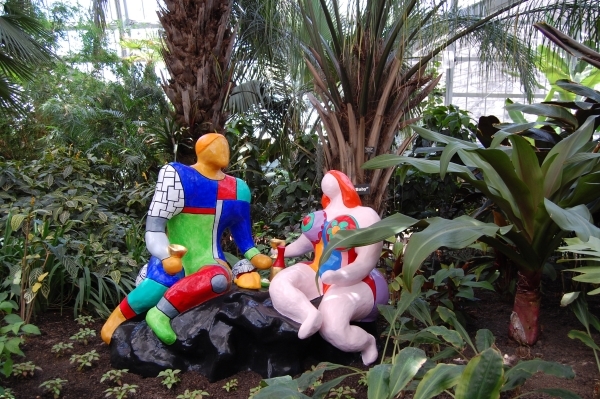 This “joyful hommage to the pair of sculptors and their magical creations” will be broadcast Monday 23 August at 11:25 pm (23:25) European time. It will be rebroadcast 6 September at 11:20 am. 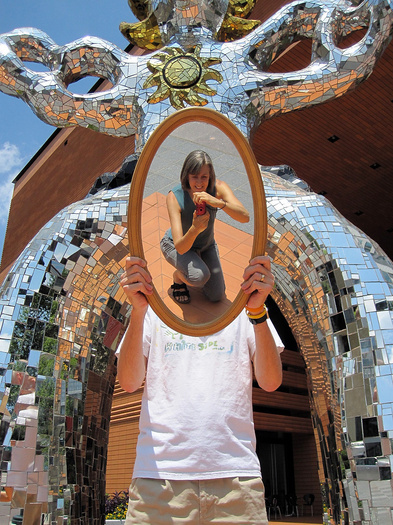 In June, the Charlotte Observer invited its readers to send photos of themselves with Niki de Saint Phalle’s Firebird (Le grand oiseau de feu sur l’arche), now on permanent public display in front of the new Bechtler Museum of Modern Art. The winners of this competition are graphic designer Rachel Hewitt and her husband, Eric Whiteside, a high school English teacher. “That’s me in the mirror,” says Rachel. Congratulations to Rachel and Eric, the other finalists, and everyone else who entered. To see other entries, visit the Charlotte Observer web site. Think of pop art, and a list of names comes quickly to mind: Andy Warhol, Roy Lichtenstein, Claes Oldenburg, Richard Hamilton, Robert Indiana, Ed Ruscha, Mel Ramos, Wayne Thiebaud, Jim Dine. While their work drew on consumerism and they shared a conversion of the everyday “popular” object into the subject matter of art, those pop artists also have another thing in common: They are all male, and that old-boys club has largely stood for a half-century. With “Seductive Subversion: Women Pop Artists, 1958-1968,” now on view at the Sheldon Museum of Art, the door to that club is being kicked in, forcing a re-examination of pop art and creating a new story of the movement from art and artists now being rediscovered. Among them is Dorothy Grebenak, who created handmade hooked rugs depicting a “Tide Box,” a “Bugatti” logo, a “Two Dollar Bill” and a Babe Ruth baseball card, all of which are on view in the Sheldon exhibition. What makes Grebenak of particular interest here, however, isn’t that she was self-taught, that her rugs were originally sold in the gift shop of the Brooklyn Museum, or even the work itself. She was a native Nebraskan, born in Oxford in 1913. I had not heard of her until I saw the show and was taken with her rugs. I didn’t know she was from Nebraska until I read the extensive, and highly recommended, catalog. This kind of discovery makes “Seductive Subversion” an important exhibition and a perfect fit for Sheldon’s “Year of the Woman” programming. To understand the women’s art and why it is only now coming to the surface, it is critical to remember the times in which it was made. Drawing on consumerism and its images, pop art tapped into an advertising/media culture that had two equally stereotyping and limiting views of women. In the first, women were marketing targets, recipients of a barrage of advertising for household goods, food, children’s items and more that reinforced traditional roles of homemaking, domesticity and nurture of the nuclear family. The women in the exhibition were able to find that position in pop. But as artist Martha Rosler writes, it wasn’t easy because pop explicitly worked against the feminine. Then there’s the fact that many of the female pop artists, including Marisol, Pauline Boty and Niki de Saint Phalle, worked as actresses or models and were caught in what curator Sid Sachs calls “the beauty trap,” while others were married to male artists and were expected to serve them as wives. The deck was stacked against them. Given the institutionalized sexism and the male-dominated view of the movement, it is hardly surprising that it has taken decades to recognize the female contribution to pop. It’s also not surprising that much of the work in the exhibition, organized by University of the Arts, Philadelphia, that was pushed to the side by critics and galleries in the ’60s is as strong as that of the male pop artists and often contains far more social critique. Even more explicitly political/social/critical is “Countdown to Violence,” a 1964 Boty painting combining images of the recently assassinated President John F. Kennedy and Abraham Lincoln and a caisson along with a Southern policeman grabbing a black man around the neck, while a German shepherd threatens the victim. The central image of the piece: a rose being cut on its stem by a woman’s hand. Boty’s 1962 “With Love to Jean-Paul Belmondo” is just as subversive, conveying a female gaze of the teeming sexuality of the French movie star, a drastic reversal for its time. 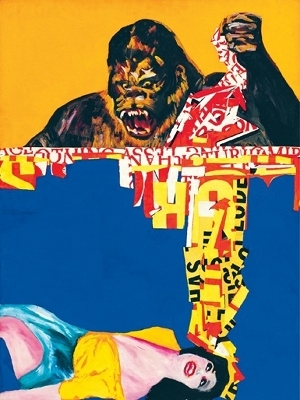 It hangs in a gallery with a series of paintings by Rosalyn Drexler, who looks at “Chubby Checker,” “Home Movies” and “King Kong aka The Dream.” The images, by adding frames and multiple images, explore the nature of cinema at all levels. But the celebrity portrait that makes the biggest point is “John Wayne,” a large wooden sculpture of a cowboy atop a flat carousel horse topped by a box covered with four images of the Western star. Made in 1962-63, the sculpture is both an acknowledgement of Wayne’s towering Hollywood status at the time and a hint, via its humor, that the cowboy was already a fading icon. “John Wayne” is by Marisol, the best known of the female pop artists and the only one to have come close to making it into the canon. She, however, has become less and less known over the years, her work in wood banishing her from serious critical consideration. Like their male counterparts, female pop artists were drawing from the same inspiration: the emerging post-World War II consumer society and its attendant technology in the rise of television and popular iconography. That means there’s plenty of unavoidable crossover of subject matter and approach. Kay Kurt’s large 1968 painting “For All Their Innocent Airs, They Know Exactly Where They’re Going,” a depiction of paper-wrapped candies in a box, brings to mind Thiebaud’s food paintings. The graphic silhouettes and backgrounds of Idelle Weber’s “Bride and Groom” and “Munchins I, II, and III” come from something of the same place as Lichtenstein’s comic book adaptations. But her works are true critiques, particularly the latter, a depiction of the era’s “organization man” going up and down what appear to be escalators. Even Ramos’ pin-up girls have an echo. Marjorie Strider’s “Triptych II, Beach Girl” uses a molded canvas to repeat three images of a woman in a bikini, her breasts jutting out from the surface. It’s as explicit a critique of the male gaze as can be seen. It seems odd to contrast the work of the women in the exhibition only to men. But in terms of the pop style, those are the only possible comparisons. It is, I suppose, possible to talk about the female pop artists in light of the work by women who followed them. But that would be both overstating the influence of the 1960s artists – they were largely obscure to all – and unfair to them and the later artists. Most of the work in “Seductive Subversion” is proto-feminist. Feminism was only in its early stages when pop art flourished, and few of the women represented in the exhibition were part of the early feminist art movement led by Miriam Schapiro and Judy Chicago. 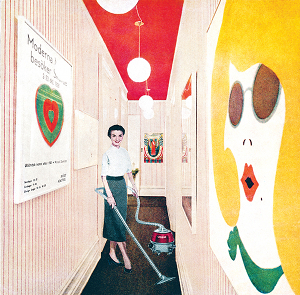 But, as Rosler points out in her catalog essay, the impact of feminism over the past four decades has helped create the impetus for a revised view of women in pop art and their work. Viewed through that lens, the art and artists in “Seductive Subversion” are groundbreaking. All of this theory and history is important; it’s why the exhibition exists. But it would amount to little if the show lacked visual punch. It is, to say the least, eye catching and entertaining in museum show fashion. 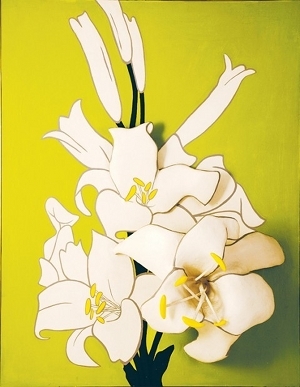 Smartly hung by subject matter, the exhibition contains plenty of the instantly recognizable images that define pop art. 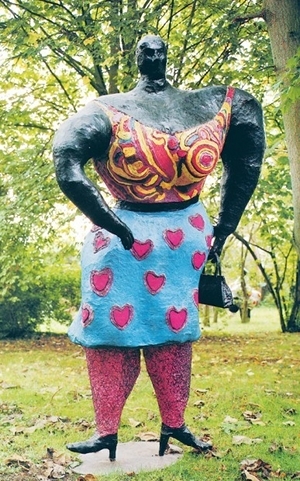 In pieces like De Saint Phalle’s giant sculpture of a woman, “Black Rosy or My Heart Belongs to Rosy,” it has the smile-inducing playfulness that has made pop the most widely embraced of the modern arts movements. That march of movements, from impressionism through cubism, surrealism, abstract expressionism and more, came crashing to a close with pop and minimalism, shattering into the pluralism of the contemporary art world. That history makes “Subversive Seduction” a critical exhibition in understanding the depth and breadth of pop art and in establishing the little-known or appreciated female role in the movement. The visual punch of the work itself makes it one of the best Sheldon shows in recent years.